The main goal of a television commercial is to inspire – inspire the viewer to buy the product being advertised. I don’t know how Coca-Cola’s Powerade is doing in its battle for supremacy against Gatorade and the rest of the crowded sports drink field. But whether it translated into additional sales or not, Powerade certainly succeeded in generating a lot of buzz in the hockey world with an ad campaign it in unveiled last March. In the 31-second spot, cameras quick-cut to athletes seemingly cast against type: a smallish basketball player driving to the hoop through a field of giants; a slow defensive football player on a search-and-destroy mission for someone to hit; a female wrestler preparing to do battle; a black hockey player skating with his teammates. “Too slow,” the football player continues. “Not in the right sport?” the black hockey player asks. “In the wrong body?’ the woman wrestler says. The hockey player’s presence and speaking lines struck a chord on the Internet and at ice rinks. Many viewers and hockey players of color saw it as an “Aha” moment, a recognition by the mainstream media – or at least Madison Avenue (actually, a Portland, Ore., advertising firm developed the ad) – of the growth of minority participation and interest in hockey. Poking the eyes of athletic stereotypes was the theme of Powerade’s ad campaign. “Perhaps through market research and focus groups, the ad people have seen the future and it looks like (Seth) Jones,” writer Joe Lapointe penned in The Toronto Globe and Mail, referring to the Nashville Predators’ first-round draft pick. Jones was taken fourth overall in the NHL draft last month, the highest an Afircan-American player has ever been chosen. Some people expressed racial discomfort with the ad. And some less enlightened folks – practitioners of “keyboard courage,” to borrow a phrase from Washington Capitals owner Ted Leonsis – took to the Internet and Twitter to crudely proclaim the ad a fraud. After all, black people don’t play hockey, several tweets and blog posts insisted in much stronger language. “Hockey’s own Jackie Robinson impersonator,” was one of the few printable takes from a review of the ad from the web site castefootball.us. The ad provoked a lot of thought and generated a lot of talk. Just what the people at Coca-Cola, the maker of Powerade, had hoped for. Thompson said the commercial was shot at an ice rink in Los Angeles, home of the then-Stanley Cup champion Los Angeles Kings, with actors who had the on-ice skills to keep it real. To the naked eye they are nothing more than buildings – unremarkable structures that house sheets of ice, scoreboards, benches and locker rooms. But a handful of ice skating rinks across the United States and Canada are much more. They bear the names of minorities who’ve contributed to hockey history and their left imprint on the game and in the communities that these rinks serve. Some of the rinks may not look like much, but they mean a lot in terms of the little-known story of hockey’s rich minority legacy. From the shores of Atlantic City, N.J., to the chilly river banks of Fredericton, New Brunswick, Canada, the rinks offer a mixed roll call of recognizable and some not-so recognizable figures. Last year, the city’s Boardwalk and convention center officials renamed the Boardwalk Hall ice skating rink The Art Dorrington Ice Rink with an elaborate ceremony that was attended by Willie O’Ree, the man who broke the National Hockey League color barrier eight years after Dorrington signed his pro contract. O’Ree, who broke in with the Boston Bruins in 1958, knows how Dorrington felt. In 2007, officials in his home town of Fredericton, N.B., voted to name a new rink in his honor. Today, the city’s Wilie O’Ree Place is a state-of-the-art facility with two NHL-sized rinks, 11 locker rooms, an indoor walking track and three community rooms. Angela James has been racking up honors lately. Regarded as the best female hockey player of her era, she was inducted into the Hockey Hall of Fame in 2010 and the International Ice Hockey Hall of Fame in 2008, and the Black Hockey and Sports Hall of Fame in 2006. But she said one her biggest honors came when folks in North York, Ont., renamed the old Flemingdon Arena the Angela James Arena in 2009. “That was right up there with everything else that’s happened in my life,” she told me. “It meant a lot to me and my family. It was a gathering of my family and community. To see that while I’m living was great.”James said seeing her name on the rink serves as inspiration to minority kids in her area who are lacing up the skates and reaching for sticks. In 1999, city officials renamed the rink the Laura Sims Skate House in Cobbs Creek Park. Then-President Bill Clinton sent a letter honoring the late Sims that was read at the dedication ceremony. But time wasn’t kind to the rink. With a city in budgetary crisis, the semi-enclosed rink fell into disrepair with a leaky roof, battered walls, iffy ice, awful locker facilities and other unsafe conditions. As the city’s budget woes worsened, Mayor Michael Nutter signaled that the city might be unable to afford to open its public rinks for the winter season. Snider’s Ed Snider Youth Hockey Foundation took over Sims and other city-run rinks in 2008. In 2010, Snider’s foundation kicked in $6.5 million, which was matched by state funds, to renovate Sims and three other down-and-out public rinks. In late 2011, the Sims rink began life anew – fully enclosed, with NHL-caliber lighting, glass and boards. 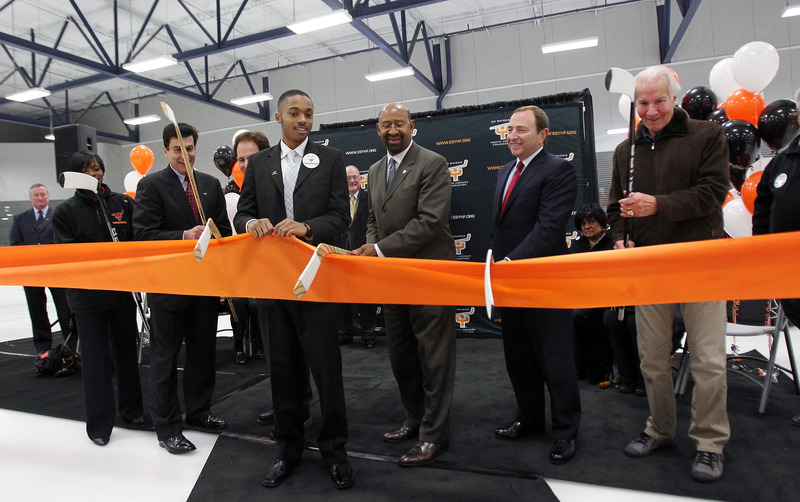 Now open year-round, it’s the flagship rink among four rinks that house nearly 3,000 mostly-minority kids who participate in the Snider Hockey program. The late Herb Carnegie is yet to recognized for his achievements by the Hockey Hall of Fame, but the city of North York honored the hockey pioneer in 2005 by renaming the North York Centennial Stadium the Herbert H. Carnegie Arena. The son of Jamaican immigrants to Canada, Carnegie was a dazzling center who’s regarded as the best black player never to play in the NHL. Held back by his color, Carnegie played for the Quebec Aces, where he was teammates with Montreal Canadiens’ great Jean Beliveau. Carnegie, who died last year, was part of the famed “Black Aces” – a high-scoring all-black line with his brother, Ossie, and Manny McIntyre. Herb Carnegie was inducted into Canada’s Sports Hall of Fame in 2001 and he was named to the Order of Canada in 2003. Will the Hall be ready for Freddie this time? The Hockey Hall of Fame in Toronto has become an increasingly diverse place over the years. Grant Fuhr, goaltender during the Edmonton Oilers’ Stanley Cup runs, became the first black player in the Hall when he was inducted in 2003. U.S. hockey player Cammi Granato and Canadian hockey sensation Angela James joined the previously all-boys club when they were inducted in 2010. James, regarded as the female Wayne Gretzky of Canada, became the second black player and first black woman to enter the Hall. There’s room for anyone of distinction and accomplishment in the hallowed Hall, regardless of race or gender. But what about room for diversity in hockey style or philosophy? What about Fred Shero? Those questions will be answered Tuesday afternoon when Hockey Hall of Fame officials announce their 2013 inductees Tuesday. The late Fred Shero guided the Philadelphia Flyers to two Stanley Cups and revolutionized NHL coaching along the way. Will that be enough for a call from the Hall? Shero is among a talent-rich pool of 2013 finalists the Hall that includes Detroit Red Wings right wing Brendan Shanahan, Chicago Blackhawks center Jeremy Roenick, Edmonton Oilers defenseman Kevin Lowe, and Flyers center Eric Lindros. 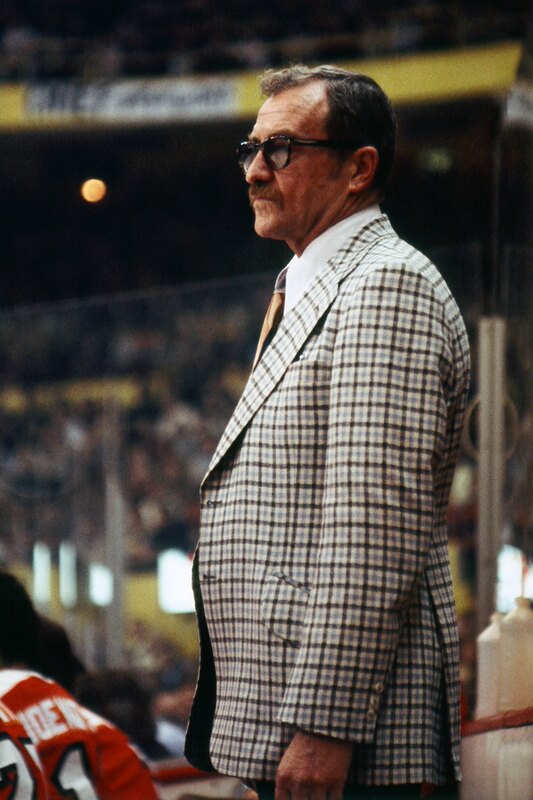 Shero coached the Philadelphia Flyers to their back-to-back Stanley Cup championships in 1973-74 and 1974-75. He also coached the New York Rangers during a 10-year NHL career in which he complied a record of 390 wins, 225 losses and 119 ties (no shootout in those days). Aside from Lindros – who faces questions about whether he fulfilled lofty expectations during his concussion-abbreviated 14-year career – Shero seems to be the toughest call for the Hall in the minds of some in the hockey establishment. To them, the unconventional Shero embodied everything bad about the game: He was the ringmaster of Flyers teams that willfully and gleefully punched, kicked, crosschecked, tripped, slashed, mugged and gooned its way to two Cups. To many, the “Broad Street Bullies” were more about the brutality of Dave “The Hammer” Schultz, Don “Big Bird” Saleski, Andre “Moose” Dupont, and Bob “The Hound” Kelly than the scoring prowess of Bobby Clarke (no Boy Scout himself), Bill Barber, Reggie Leach and Rick MacLeish and the elegant goaltending of Bernie Parent. When some hockey purists look at the Flyers of that era they see a real-life “Slap Shot” with Shero subbing for Paul Newman as Reggie Dunlop. If they looked beyond the punches and penalty minutes they might understand why Shero, who died in 1990, belongs in the Hall and is aptly nominated in its “builders” category. That’s because he helped build the foundation for modern-day coaching in the NHL. He was the first NHL coach to hire a fulltime assistant coach – Mike Nykoluk – and have him on the bench (some teams today have assistant or associate coaches for defense, offense, power plays, penalty killing and goaltending); the first NHL coach to visit the old Soviet Union and incorporate many of their systems, which are staples in hockey today. He was a master motivator, though he earned the nickname “Freddie the Fog” because his players and sports writers didn’t always comprehend his thoughts. But Shero was clear as a bell when he scribbled a message on the Flyers’ locker room board before Game 6 of the 1974-75 Stanley Cup Final against Phil Esposito, Bobby Orr and the rest of the Boston Bruins: “Win today and we walk together forever.” The Flyers won that game 1-0 and, true to his word, players from that team to this day share a closeness between themselves and a city that is unbreakable. Four members of the Cup-winning Flyers team are already enshrined in the Hall – center Clarke, left wing Barber, team founder Ed Snider and general manager Keith Allen, who built the teams. Why an innovator like Shero isn’t in the Hall with coaching peers Scotty Bowman, Herb Brooks, Emile Francis, Al Albour, and Punch Imlach is a mystery to many of “The Fog’s” supporters. They hope the mystery will be solved on Tuesday. Sunday’s 2013 NHL Draft may go down in the record books as one of the deepest in terms of the quality of the players picked. It also may go down in history in terms of the number of players of color among the 211 players drafted. “Black talent goes early in NHL draft,” read a proud headline from the online edition of The St. Louis American, the city’s weekly African-American newspaper. At least eight players of color were chosen over seven rounds during the day-long festivities at the Prudential Center in Newark, N.J. They all hope to some day play in a National Hockey League that’s already growing more diverse. According to the league, there were 69 minority players in the 2012-13 season, including 44 who were on season-opening team rosters. Of the 44, half were black, 11 were native/aboriginal, four were Hispanic, three were Asian, two were West Asian/Arab, one was Inuit and one South Asian/Indian. Much of the attention at the draft focused on defenseman Seth Jones, a projected Number One pick in the eyes of many, and defenseman Darnell Nurse, who worked his way into the Top 10 player rankings in the weeks leading to the draft. Jones, the son of former NBA player Popeye Jones, was selected fourth by the Nashville Predators, the highest an African-American player has ever been chosen. Nurse, a Canadian and nephew of retired Philadelphia Eagles quarterback Donovan McNabb, went seventh to the Edmonton Oilers. But he would have won the draft’s “Top Quote Award” – if they offered one – for reminding folks about how Uncle Donovan was treated by the Philly faithful when he was drafted in 1999. Defenseman Madison Bowey hopes to Rock the Red for the Washington Capitals. Right Wing Justin Bailey should feel right at home if he makes the Buffalo Sabres roster after the team drafted him in the second round with the 52 overall pick. The Kitchener Rangers junior player grew up in Williamsville, N.Y., about a 20 minute drive to downtown Buffalo. Like Jones and Nurse, Bailey comes from a pro-sports family. His father, Carlton Bailey, was a linebacker for the NFL’s Buffalo Bills. Justin Bailey scored 17 goals, notched 19 assists and was a plus-22 in 57 games for the OHL Rangers in the 2012-13 season. Jonathan-Ismael Diaby of the Quebec Major Junior Hockey League Victoriaville Tigres is yet another big defenseman taken in the draft. The Predators, who took big defenseman Jones in the first round, selected Diaby with the 64th pick in the third round. Again, Diaby has an athletic pedigree. His father, from the Ivory Coast, played professional soccer in Africa. Jonathan-Ismael Diaby hopes to make the Nashville Predators with Seth Jones. With the 69th pick in the third round, the Sabres selected Nicholas Baptiste, a versatile right wing from the OHL Sudbury Wolves. Apparently, so did the Sabres. Winger Nicholas Baptiste’s dedication to defense boosted his draft stock and landed him in Buffalo. Defenseman Jordan Subban had to wait until the draft’s fourth round to hear his familiar last name called. The Vancouver Canucks took the Belleville Bulls blueliner with the 115th pick. He’s the brother of Montreal Canadiens defenseman P.K. Subban and goaltender Malcolm Subban, who was a first-round pick of the Boston Bruins last year. Jordan Subban is a departure from most of the defensemen taken in the draft and he plays a much different game than bigger big brother P.K., who was awarded the Norris Trophy last month as the NHL’s best defenseman in the 2012-13 season. The younger Subban is small, about 5-foot-9, 177 pounds. But he has survived and thrived in hockey as an offensive-minded, puck-moving defenseman, a commodity that most NHL teams covet. P.K. Subban said NHL teams shouldn’t be fooled by Jordan’s size. He said Jordan plays big and has more skills than he does. The waiting was the hardest part for defenseman Jordan Subban. But the Vancouver Canucks made it worthwhile. The entire Subban clan sat in the Prudential Center waiting for Jordan to be picked. The family exploded with joy when Vancouver finally made the call.